Use these videos to help students/children learn the multiplication tables from 2 to 12. They are presented in a specific order — easiest ones first — which makes learning them MUCH easier. First, we study the SKIP-COUNTING list or pattern for the specific table. Next, I drill the table itself, but the STRUCTURE of the table is visible to the student during the drill. This ties the table with the just-learned skip-counting list, and also helps the student to use the CONCEPT of multiplication to possibly figure out some of the answers that are not yet memorized. Lastly, we practice the table backwards. For example, I ask, "How many times 5 is 35?" This essentially teaches the basic division facts at the same time (though, I don't mention them as such). 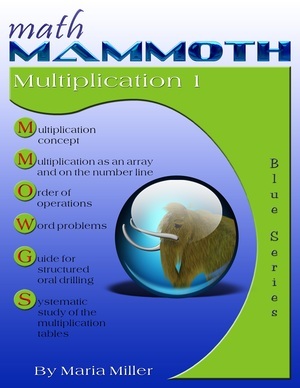 This set of videos matches the lessons in my workbook Math Mammoth Multiplication 1, and Chapter 3 of Math Mammoth Grade 3 Complete Curriculum. Also, practically all the lessons (table of 9 is an exception) are divided into two parts. The first part has to do with the drill of the particular multiplication table, and the second part contains varied multiplication practice, such as word problems, patterns, missing number exercises, and puzzles. I call those "second" parts "INTERLUDES" in the video list below. You can read more about my approach to the memorization of times tables in my article on the topic. As an additional practice tool, check out the online practice for multiplication tables here at MathMammoth.com. A self-teaching worktext for 3rd grade that covers multiplication concept from various angles, word problems, a guide for structural drilling, and a complete study of all 12 multiplication tables. Available as an affordable download ($5.00), and also as a printed copy. => Learn more and see the free samples! Learn 'Em Forwards and Backwards — a free online program by David Chandler that helps you practice and master the multiplication tables using the SAME order of learning the tables as in the above videos, in my book Math Mammoth Multiplication 1, and in Math Mammoth Grade 3 curriculum.